Martin and Tony punch through on the Lochsa. Not many of us huck off 100-foot waterfalls or paddle around Greenland, but every time we venture out on the water, we are in an alien environment. We are land animals who have adapted to the water world through the use of gear and strategy. Whatever kind of boating you do, you’re taking on some degree of risk. Only by using good judgment and the right kind of gear do you have a reasonable assurance of getting back safely. Good gear is readily available, certainly right here at NRS. But the judgment part comes from what you pack between your ears, a working, right-thinking brain. The secret, if there is a secret, to safe boating is recognizing what your limits are and staying within those limits. This includes the limits of your skill and of your equipment. You extend your limits with practice and by acquiring better equipment. However, if you exceed the current limits of your skills and/or equipment, you are increasing the odds that you won’t come home safe. Dan practices his rescue bag technique. 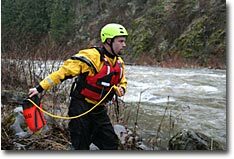 Wear your life jacket, check weather conditions and water levels. Always leave word with someone about where you’re going and when you’ll return. Learn and practice techniques of self-rescue and of rescuing others. Check the condition of your gear before you go out. Repair or replace worn or damaged equipment. Carry repair and medical kits and signaling gear. 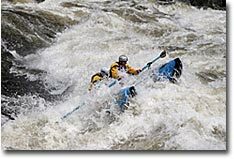 Don’t hesitate to portage or line a rapid or to turn back if conditions aren’t right. You’re out there to have fun. Getting injured or dead isn’t fun. Remember: Going out is optional. Coming back is mandatory. "I just wanted to tell you how very much I appreciated your article on the motto: 'Coming back is mandatory.' In early January I drove from southern California to the Everglades for a week-and-a-half solo paddle. At the Everglades, I realized that my solo canoe, though well proven in river rapids, just wasn't suited for open water crossings in stiff winds. Off-shore self rescue was a daunting prospect. After one night out and NOAA's prediction of the winds continuing for the entire trip, I turned back. Of course, one wonders if he did the right thing, aborting such a trip after so much preparation and travel. Your article helps me feel much better about my decision – clearly the right decision, but not real easy. Thank you for the validation!" George is a serious paddler who likes to travel around the country, focusing on the waters of a particular region on each trip. Thanks, George, for modeling good judgment, for writing in and for coming back!